House Speaker John Boehner’s proposed lawsuit against Barack Obama is causing a great deal of chatter in Washington. Political stunt, as Obama has called it? Or, maybe, checkmate, Obama? There is a quiet gap in the U.S. Constitution. There is no explicit mechanism to discipline a president who fails to carry out his Constitutional duties. This gap sat there, barely noticed, for centuries. Barack Obama, apparently, noticed it. He is exploiting it. That exploitation is a serious departure from Constitutional principle … whether or not one supports his policies, whether one is a progressive or conservative. John Boehner now is mobilizing a Congressional lawsuit to put a stop to it. This is not about Obama “doing his job.” This is about Obama not doing his job and, indeed, deviating, flagrantly, from an explicit Constitutional duty. Although the Supreme Court is loathe to arbitrate between the political branches, this is not that. This is about the president adhering to the Constitution. There are reasons to believe that the Supreme Court may see this president as in flagrant Constitutional dereliction. There is no explicit mechanism to sanction a president for failure to preserve the Constitution or faithfully execute the laws. The Constitution provides only for the impeachment and removal of a president from office and then only for “treason, bribery, or other high crimes and misdemeanors.” Obama, manifestly, has not committed an impeachable offense. Violating one’s oath of office is not even a misdemeanor. Call it “the case of the faithless president.” It is not, at base, a skirmish between Congressional and executive power. It is much more serious than that. It is about fidelity to the Constitution. What to do about a president who demonstrably is faithless in his execution of the laws? For over two centuries presidents have tended, mostly, to respect their explicit Constitutional duty to take care faithfully to execute the laws. Yes, other presidents have overreached. Obama and his cabinet, however, have taken this dereliction to a whole new level. Obama ruthlessly has been exploiting the lack of an explicit mechanism to stop a president from being faithless in his execution of the laws. The exploitation of this gap may now blow up in Obama’s face. John Boehner has lit the fuse. Obama has failed faithfully to execute the laws so many times, in so many ways, so relentlessly, and so brazenly, that he may have changed the game… in a manner that now may come to haunt him. The other branches of the federal government appear, finally, to be rallying from their incredulity and coming to terms with something that poses a threat to the foundation of federal legitimacy. We of the Commentariat have yet to grasp the magnitude of this. No worries. Boehner is far more astute than the chattering class. His lawsuit presents as, potentially, a stroke of political genius and historic Constitutional statesmanship. This president has much to worry about being held to account. Obama has condemned Boehner’s lawsuit as a “political stunt.” Wrong. Even Republicans have portrayed this lawsuit as at best a long shot. Wrong. Others portray it as a desperate move. Wrong. Proving that Obama misused his executive power is a long shot, most Republicans privately concede. Some even say that it is simply a way to quiet down the growing number of fringe Republicans who have said the party should move to impeach the president. Obama and congressional Democrats are publicly dismissing talk of the lawsuit as little more than a desperate move by Republicans in the months before an election. The nub of the matter is not a matter of “misuse” of executive power. It’s a matter of failing to carry out an unequivocal Constitutional directive. A Supreme Court refusal to give Congress standing for this this would say, by implication, that a president blatantly can ignore his Constitutional duty faithfully to carry out the laws. That implication would be certain to be exploited by future presidents of both parties. This is a subtle “design flaw” that only the Supreme Court can cure. Boehner’s strategy is an elegant one. Those who consider it a facile political move to placate the hotheads talking impeachment are completely missing the play. The usually discerning Jonathan Capehart, of the Washington Post, frets that this maneuver will bring about the very thing — impeachment proceedings — it is designed to avert. Not so. Boehner’s hand is sure, his prestige within his caucus high. Bringing this lawsuit is far more dignified than would be a circus of impeachment proceedings, and more potent. And more pertinent. The legitimacy of the Supreme Court would, as it should, defuse potential political reaction. Will the Supreme Court entertain it? The court famously is reluctant to arbitrate between the two political branches. Yet … this is not a mere power struggle between those branches. It is something much deeper. Obama’s brazenness in ignoring his black letter Constitutional duty well might persuade the Supreme Court to put aside its reluctance. The court ruled 9-0 that Obama’s appointments were unconstitutional because the Senate was not truly in recess when he made them during a three-day break in pro forma meetings of the legislative body. America’s most influential federal appeals court, the DC Circuit, recently struck down a key aspect of Obamacare. So … what’s Planet Progressive’s reaction to Boehners’ proposed lawsuit? When I called the impending lawsuit against President Obama by House Speaker John Boehner “frivolous” last week and questioned whether the House even had standing to bring such litigation, renowned Harvard constitutional law professor Laurence Tribe cautioned me. From “plausible basis” to quoting Gertrude Stein represents a truly abrupt 180 by Professor Tribe. (One fairly might infer that Prof. Tribe, in that intervening week, got quietly taken to the woodshed for breaking the party line.) Progressives, en banc as it were, now are whistling past the graveyard. The court has latitude in defining standing. In Roe v. Wade the Court rendered judgment notwithstanding that the birth of the unborn baby had occurred, rendering its decision moot. The court hears what it wishes to hear. The standing doctrine consists both of constitutionally-derived rules and judicially-created gatekeeping (“prudential”) rules. Fiddlesticks. A president’s failure to take care that the laws be faithfully executed is the real Constitutional crisis. 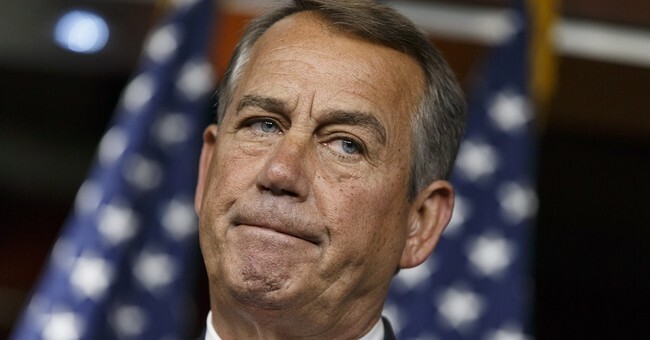 Boehner’s lawsuit is designed to end, not precipitate, a crisis. Much more than Obamacare is at stake with John Boehner’s lawsuit. The very legitimacy of the Obama administration is on the line. This is a much bigger deal than any policy squabble, however important the policy. Can a president really flout explicit provisions in the Constitution with impunity? President Obama systematically refuses to take care that the laws be faithfully executed. The Supreme Court, to protect the Constitution, its own institutional integrity, and its reputation, well might rule on this. Obama’s breaches of Constitutional faith have been blatant and repeated. Not content with having fulfilled his true electoral mandate to bring home the troops and restore America to a peacetime footing, which this columnist has praised, Obama, by being unfaithful to a clear Constitutional directive, has put his legitimacy at risk. Comes now John Boehner to checkmate a renegade President. Simply by bringing this action Boehner deserves to go down in history as a great Speaker, a great defender of liberty, and a statesman. If he wins, as well he might: Checkmate, Obama.